Jourdan Dunn and Cara Delevingne are known besties. Their instagram feeds read like love letters to one another and, yes, we love the best friend girl crush that they seem to have going on. Just a few hours ago, however, they took their friendship to another level and one that involves pain. Alright, don't get all strange on us. We're just talking about a little pain here in the form of matching tattoos. While most people would get a heart around the words "best friends," Dunn and Delevingne went properly personal with double Ds. 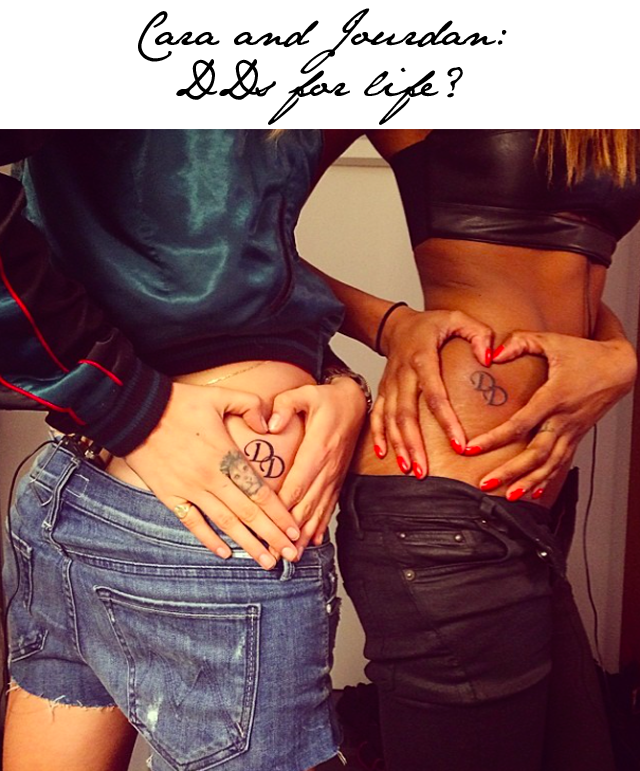 Yes, the two are now sporting friendship tattoos showing off the first initial of their surnames. Love or hate tattoos, you have to admit this is sorta kind sweet in a away. This is certainly not the first time under the needle for either model. As you can see, Cara is sporting her infamous Lion Tattooed finger. And let's not forget Cara's Made in England tattoo on her foot.